Stair Dismount™ has been re-created for the iPhone, iPod touch & iPad as well as Android™ phones. You can download it for free from the App Store for the iOS devices, or from Google Play Shop for your Android device. This new version has millions of players, and it also won Technical Achievement award in the 2010 IGF Mobile category awards. Go to www.stairdismount.com to visit the home page of the new version. Porrasturvat™ a.k.a. 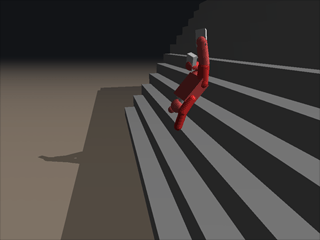 Stair Dismount™ is one of the very first games to use ragdoll physics in gameplay. The game was originally written just to contribute in the game development competition of a demoscene event called Assembly, released a few days before the event was about to start, so that people would have some time to test the competition entries before voting. By the time when the event started, the game had already found its way to tens of thousands of gamers in just a few days, and the word about the game and how fun it is kept quickly spreading around different forums. The game won the first place in the competition. Porrasturvat™ – Stair Dismount™ game info page in MobyGames.